Vinesse.com: Join America's fastest growing wine club! The offer you were searching for has expired, so we've found our most current offer for you below. Enjoy 6 Exceptional Wines for Just $41.94 Plus 1¢ Shipping — Save $116! Earn 2,500 MileagePlus Miles with United with your first shipment, 4,000 MileagePlus Miles with United with your second shipment, plus earn 7 MileagePlus Miles with United per dollar spent with every shipment thereafter. Your time is valuable. Among the many errands you have to run, why add making sure you have that perfect bottle of wine to accompany dinner? We'll take care of it for you. Our policy is simple. If you don't enjoy a wine you receive from us for any reason, call us within 45 days and we'll replace it. You can cancel with no hassles at any time. Start Earning miles With Amazing Wines Today! Enter your email below. You will complete your enrollment on the next screen. For joining the American Cellars Wine Club today, you'll receive a six-piece wine tote with your third wine club shipment as a token of our appreciation — a $37.95 value. 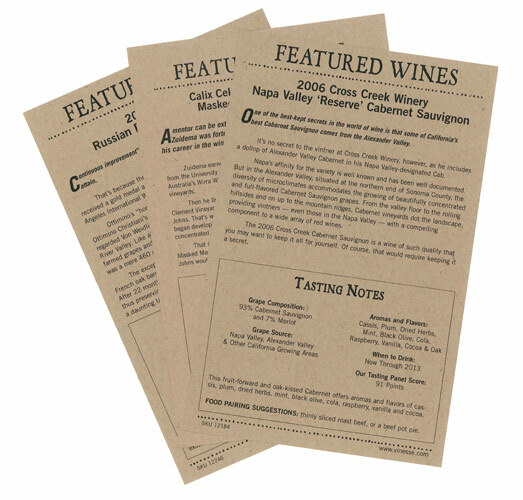 You'll receive wine tasting notes on each selection within your shipment. These individualized notes provide insights into the subtle variations of each wine — including what recipes pair well — to help you enjoy your wine to the fullest. "The wine I picked from the store tasted bad." "Should I get the 2010 or the 2009?" "It takes me forever to decide which wine to get." "There's nothing good available in my area." "Is this cab any good or should I get that pinot?" "Gewurztraminer?" Simply select your wine preference. We take care of the rest. Just set it and forget it. Our wine experts search hidden, tucked-away vineyards to ensure you'll receive the most compelling 6-bottle selections, each month at just $12–$16 per bottle (plus delivery). You'll experience not only amazing, boutique U.S. wines, but also enjoy a light sprinkling of the most exquisite international flavors. These hard-to-find wines aren't ones the average wine lover would find anywhere else — unless, of course, you happened on to stumble across the winery itself or were a close, personal friend of the winemaker. Specially selected for new or entry-level wine drinkers exploring the nuances between popular wine varietals. Also for enthusiasts that covet limited-production runs of tried-and-true varietals, like Merlot, Cabernet Sauvignon, Chardonnay, and Sauvignon Blanc. Let us weed out the duds for you, freeing you to enjoy better wine for your dollar. We negotiate great deals, leaving you to never pay for a bad wine ever again. "I love the fact that in the 2 years I have been a member, there were maybe 3 bottles I did not like. I called customer service perhaps one time, and they shipped me a different bottle." "Never again will I arrive at a dinner party or at a friend's house without a bottle or two of fine wine in hand. Thank you, Vinesse! Cheers!" "I am pleased with the first shipment of wines. I am pleased that I joined your club! I look forward to many happy years together :-)"
"I never have to think about what kind to buy, it arrives regularly. I like that I can vary the shipment frequency and stock up periodically with the specials that you run. The customer service is outstanding." Every bottle in every shipment is guaranteed. Each limited-production wine is hand-selected by our wine experts. Our policy is simple. If you don't enjoy a wine you receive from us for any reason, call us within 45 days and we'll replace it. You're not committing to a long-term membership. Enjoy as many wine shipments as you'd like. You can cancel with no hassles at any time. For 20 years, American Cellars Wine Club has delivered some of the most unique wines to members' doorsteps. Members experience not only amazing, boutique U.S. wines, but also enjoy a light sprinkling of the most exquisite international flavors. The best part: these rare wines are reserved just for our members and aren't easily found in local stores. Today, after 20 years, American Cellars Wine Club is one of the largest and most-respected wine clubs in the country. But the mission remains the same, delivering exceptional, unique wines to our members' doorsteps, and sharing the joy of a great glass of wine.